Hi Techies. In this post we will discuss Samsung Galaxy S7 & Samsung Galaxy S7 Edge Price in India, Price in USA, Release Date, Specifications & Much More. We are happy to tell you that most of the Specifications & details of Samsung Galaxy S7 post in our leaks and rumors section held true for the device. 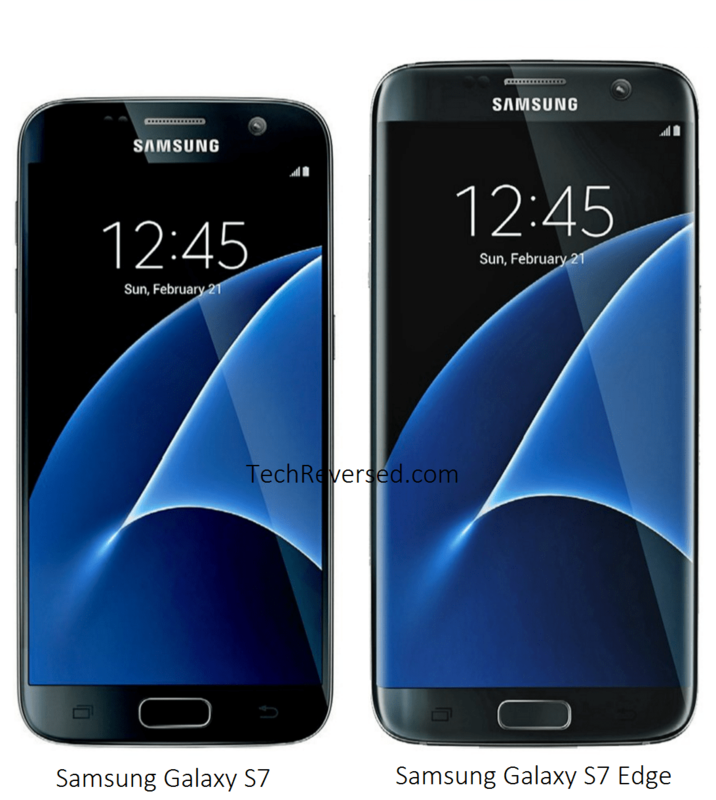 The Samsung galaxy s7 features a Snapdragon 820 CPU, 4 GB Ram, 5.1 Inch Quad HD display. Whereas the Galaxy S7 Edge comes with a 5.5 Inch Quad HD Curved edge display . (Rest of the specs are almost similar to the S7). This time the company has given a dedicated card slot for storage expansion which is a much needed update due to increased storage requirements. 5.1 Inch Quad H.D display in Galaxy S7. (~577 p.p.i pixel density). whereas 5.5 Inch Quad HD (~534 p.p.i pixel density) Curved edge display in Galaxy S7 Edge. Latest Snapdragon 820/ Exynos Octa Core CPU. Corning Gorilla Glass protection at the back. 12 MP (f/1.7 aperture) Rear camera with OIS (optical image stabilization), phase detection auto focus & 2k Video support. Compatible with Samsung’s Gear VR (Virtual Reality) headsets. Dust & Water Proof up to 1.5 Meter & 30 minutes. (IP 68 Certified). Fast Battery Charging. Quick Charge 3.0 (83% in 30 Minutes). Curved edge display (in Galaxy S7 Edge). Not much of a change in the design. Curved edge display looks good on paper but practically it is problematic such has holding the phone gets difficult also there are very few apps that can be used in edge display. (In case of S7 Edge). OS Android OS v 6.0. (Marshmallow). CPU/GPU Quad Core CPU. (2.15 GHz Dual-core Kyro CPU & 1.6 GHz Dual-core Kyro). Qualcomm Snapdragon 820. | GPU Adreno 530. Exynos 8890 Octa Core. ( 2.3 GHz Quad-core A-53 & 1.6 GHZ Quad-core A-53) CPU. | GPU Mali T-880 MP 12. DISPLAY 5.1 Inch Quad H.D Super AMOLED Display. Resolution 1440 x 2560 pixels. (~577 p.p.i pixel density). BATTERY Non-removable Li-Ion 3000 mAh. STORAGE 32/64 GB Internal Options. Expandable Up to 200 GB via Dedicated Micro SD Card Slot in Single SIM Model. 32/64 GB Internal Options. Expandable Up to 200 GB via Micro SD Card Using SIM Slot in Dual Single SIM Model. FEATURES Fingerprint sensor. | Fast Battery Charging. Quick Charge 3.0 (83% in 30 Minutes). | Quad H.D Display. | Corning Gorilla Glass. | Rear camera with OIS. | Gear VR Headset support. | 4 G Support. | Water & Dust Resistant. | Wireless Charging. DISPLAY 5.5 Inch Quad H.D Super AMOLED Curved Edge Display. Resolution 1440 x 2560 pixels. (~534 p.p.i pixel density). NETWORK 2 G/3 G/4 G L.T.E Cat 10 Support. BATTERY Non-removable Li-Ion 3600 mAh. AT&T is offering the 32 GB Model for 23.17$ for 30 months (next 24 plan). That adds to a total of 695$ (i.e equivalent to 47,250 Rupees in India). It is available in 2 Colors i.e. Black onyx, Gold Platinum. T-Mobile is offering the 32 GB Model for 27.91$ i.e. basic 24 month plan. That adds to a total of 670$ (i.e equivalent to 45,549 Rupees in India). It is available in 2 Colors i.e. Black onyx, Gold Platinum. Currently the pricing of Samsung Galaxy S7 is not announced in India. But we can expect it to cost around 47,490 Rupees in India for 32 GB Model.Talking about the release date in India, it is expected to be available in March (mid). It will come in two Colors options i.e. Black onyx, Gold Platinum. AT&T is offering the 32 GB Model for 26.50$ for 30 months (next 24 plan). That adds to a total of 795$ (i.e equivalent to 54,000 Rupees in India). It is available in 3 Colors i.e. Black onyx, Gold Platinum, Silver Titanium. T-Mobile is offering the 32 GB Model for 32.50$ i.e. basic 24 month plan. That adds to a total of 780$ (i.e equivalent to 53,000 Rupees in India). It is available in 3 Colors i.e. Black onyx, Gold Platinum, Silver Titanium. Currently It’s pricing in India is not announced. But we can expect it to cost around 54,000 Rupees in India for 32 GB Model.Talking about the release date in India, it is expected to be available in March (mid). It will come in 3 Colors options i.e. Black onyx, Gold Platinum, Silver Titanium. For More Updates Join Us on Facebook.